In 2009, I was diagnosed with Ménière's Disease. MD is an incurable condition that combines four distressing symptoms: vertigo, hearing loss, tinnitus and aural fullness. My MD is bilateral (affects both ears) and is particularly virulent. It has been treated with a chemical labyrinthectomy, which intentionally destroyed the balance function in my right ear, and a range of drugs and dietary modifications. It has also led to severe hearing loss and varying levels of tinnitus. This has had consequences for both my personal and professional life and especially my relationship with music. The aim of this document is to describe the history and development of my condition. I have to admit that I have kept it mostly secret for many years until now. MD is an invisible disability that is hard for non-sufferers to understand. A person with MD can seem to be either drunk or incapable. The medical profession is often similarly baffled. I was told more than once by doctors that MD is "over-diagnosed" and that my symptoms were more than likely something else. In fact, I have the classic MD profile which has evolved over time in exactly the way that those who know about the condition would have predicted. My secrecy was partly a matter of personal pride (not wanting to be perceived as weak) and partly a matter of professional fear. The latter arose from the high-powered position I held at De Montfort University and a strong suspicion that some of my colleagues and managers would take a dim view of a Professor of Music and Director of the Institute Of Creative Technologies with these shortcomings. To what extent my fears were justified I will never know, but I am immensely grateful to my dear wife Louise, my friend Simon Atkinson, and my two personal assistants during this period, Rebekah Harriman and Jos Atkin. They provided the personal support and professional cover without which I would probably have given up work altogether. I also thank my consultant, Professor Peter Rea, of the Leicester Balance Clinic, whose interventions have restored my life to some kind of normality, and Dr Ian Cross, a GP who made the referral to Professor Rea's clinic in the first place. I have decided to write this document now following my attendance at the "Hearing Aids for Music" conference at the University of Leeds, September 14th/15th 2017. This inspiring event opened my eyes to the possibility that one could admit to these things in public and still maintain a professional career of distinction. In fact, I have been opening up to people about my MD more often in the past few years anyway, because the professional environment at Bath Spa University is rather more sympathetic than I found it at De Montfort. Nevertheless, the majority of people I know are unaware that I have this disability, and I think it only right now to present a full account of it, both for their benefit and for the benefit of any other MD sufferers who may be reading this. I found myself desperately searching for other people with a similar condition in the early days, and derived some comfort from the knowledge that I was not alone. I hope this will help other people, and I am always keen to hear from fellow-sufferers. 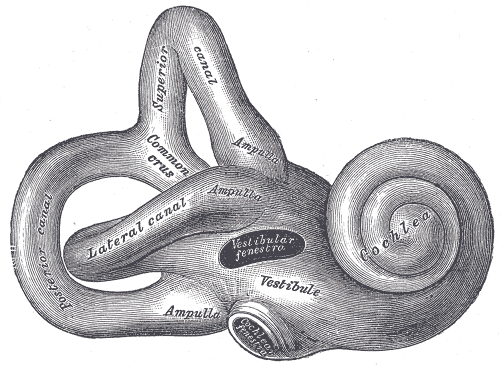 MD is a disorder of the inner ear, which is shown in brown in the next illustration. 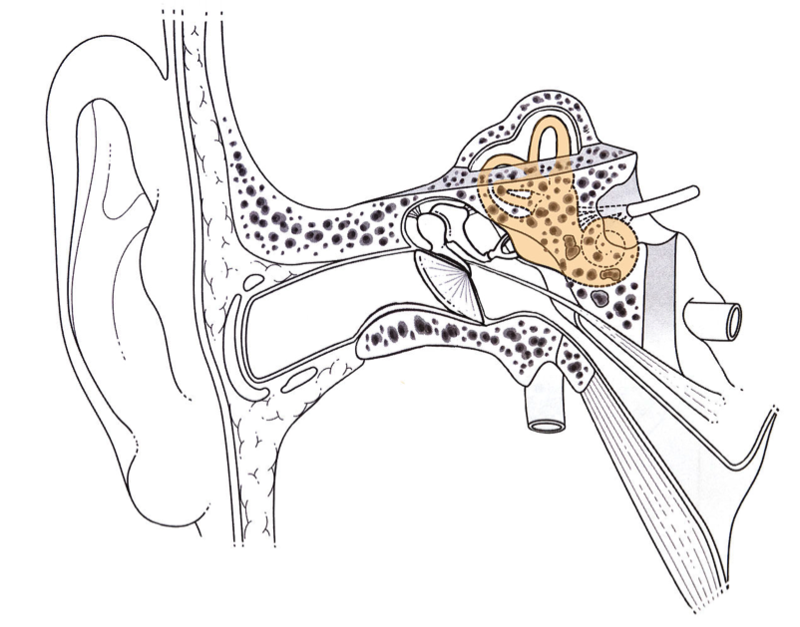 Since this contains balance functions and hearing mechanisms, both of these are affected. Nobody knows what causes MD, nor how it builds up once it has begun. However, all MD sufferers have endolymphatic hydrops, which is an excess of fluid in the semicircular canals. The fluid flows throughout the inner ear and contains various salts or electrolytes which are critical to the balance function in particular. An excess of this fluid causes a feeling of fullness in the ears and episodes of vertigo, as well as damage to the tiny hairs (cilia) that enable hearing. The situation is equally bad with regards to speech. I really struggle in any conversation where there is any kind of background noise. On very many occasions, people have spoken to me and I have not heard them. I am sure that I have also said the wrong thing many times in situations where I cannot hear someone properly and have chosen to pretend that I can hear, rather than constantly saying ‘I beg your pardon’. This is really rude on my part, and I have tried to adopt a policy of explaining the problem to people first, but sometimes this is simply not possible. My job involves talking to people all the time, so many conversations happen “on the fly” and in uncontrolled environments. Meetings present particular challenges, especially in large rooms with prominent echoes. I am pretty good at lip-reading. I am largely self-taught but did attend some classes at DeafPlus in Bath and also used the LipReader training software by David Smith. And I have my hearing aid (of which more in a moment). Even so I am afraid I miss things. Women’s voices, which are softer, are often a big problem. To those who have read this far: thank you and well done! I don’t spend my days lamenting and suffering with MD. It is just a condition that I live with and, since the vertigo has more or less ended, is one that does not intrude too much on daily life. Yet there is still plenty to grapple with in the future. In particular, I feel the need to continue to address my hearing issues. In the first instance, I want to be more open and honest about the problem, which is partly why I have written this document. But also I want to try to make a contribution to improving life for other people. For that reason, I am developing a research project that will focus on music and MD. It will involve a cross-disciplinary team including clinicians, audiologists, psychologists and musicians. I hope to work with a hearing aid manufacturer too. This is an unresearched field at present that would greatly benefit from an increased scientific understanding.